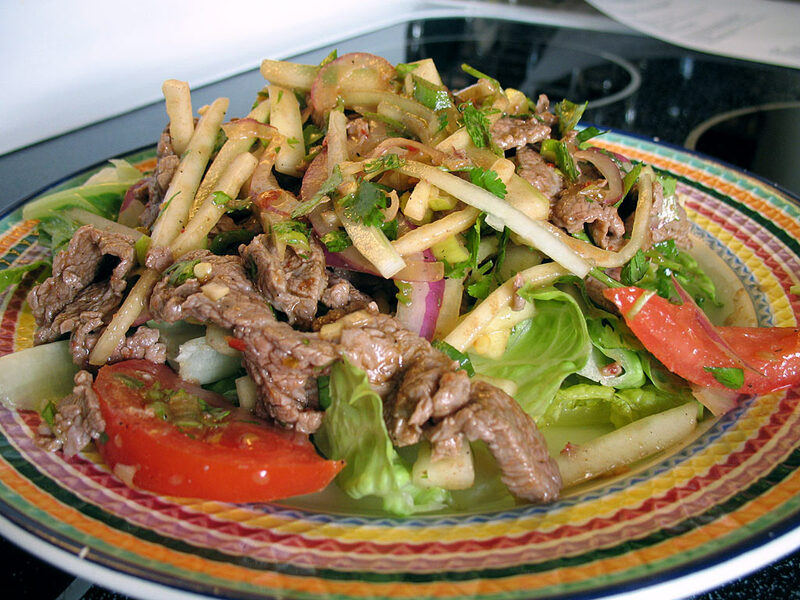 Jenn sent us this recipe for Spicy Thai Beef Salad, the way it’s made at Surin of Thailand in Atlanta. We liked this version better than the one we made a few weeks ago — it was a lot easier, and the meat cooked a lot faster on the grill since it was already sliced. As listed below, I’d call the salad “medium” on the spicy scale, I added extra chili paste to mine to enable sweat-head. Preheat a grill to medium heat. In a nonreactive bowl, combine the lime juice, fish sauce and chili paste; set aside. Slice the beef into thin strips, then grill to medium. Add to the bowl with the chili paste mixture and toss to coat. Arrange the cucumber, onion, tomato, cilantro and green onion in a bowl. Add the steak and lightly toss. Put a handful of romaine lettuce on each plate and top with the steak and cucumber mixture. This entry was posted on Tuesday, May 29th, 2007 at 8:42 pm	and is filed under Main Dishes, Thai. You can follow any responses to this entry through the RSS 2.0 feed. You can leave a response, or trackback from your own site.